Jacob’s Project is pleased to report an incredibly productive 2013 after all of the public endorsements received last year for the development of an environmental education park at Sinking Creek wetlands. Last year’s support enabled the Johnson City Commission to approve 28 acres of undevelopable city land on King Springs Road for a Sinking Creek Wetlands Center. Tim Ormond from HydroCycle Engineering and Greg Babbitt from EcoFlow Consulting completed surveys and designs for the excavation of 2.1 acres of additional wetlands with native plantings that will help filter pathogens and pollutants from Sinking Creek. The Boone Watershed Partnership, with the leadership of Gary Barrigar, moved swiftly with Johnson City Public Works Director Phil Pindzola and his staff to implement the plan for wetlands enhancement at the site. Despite the wet summer and ongoing city construction projects, excavation began in August and the wetlands expansion and streambank restoration was completed within a few weeks. There now exist over five acres of wetlands and a gravel parking lot with an interpretive sign at the site. Students and faculty from the East Tennessee State University (ETSU)completed a plant survey of the wetlands and provided consultation for removing invasive and planting native species. 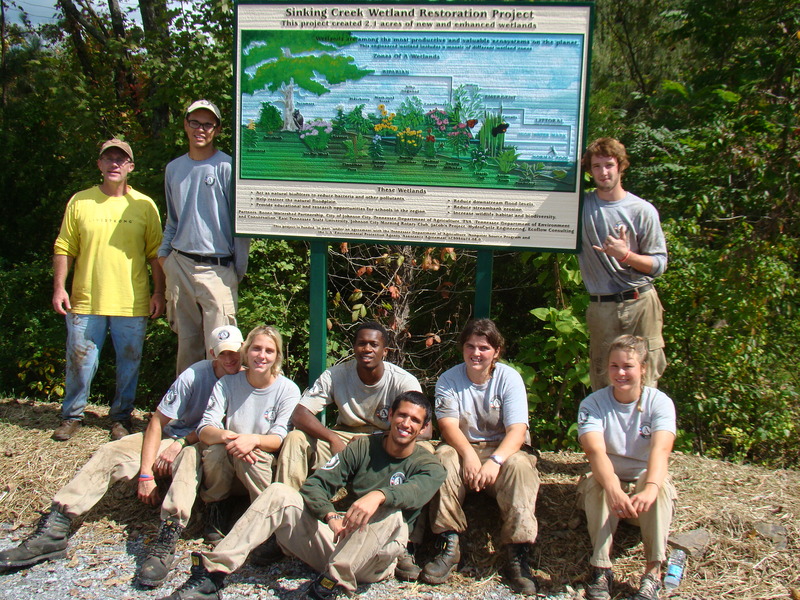 A huge cleanup of the expanded wetlands was completed with the help of AmeriCorps Volunteers and ETSU students. Too many bags of trash, tires and other objects were hauled away. It is a real eye-opener to learn how much trash can accumulate along the banks of a stream and its wetlands. During the end of September, a Sinking Creek Restoration Celebration with nearly fifty attendees was held at the Sinking Creek Baptist Church pavilion with a tour to the site. Physical work for the year concluded with a hearty community-group who planted roughly 400 plants and trees at the site in November. The support of the Johnson City Morning Rotary Club with the development of a Sinking Creek Wetlands Center has been so exciting. Members designed an informative, attractive booklet for adults to read about how to protect their families from E. coli bacteria. They paid for the printing of 1,000 booklets that have been distributed at different events and person-to-person. The group coined the name, “Jacob’s Project” to encompass: 1) Raising awareness; 2) Providing education; 3) Saving Sinking Creek. Through their outreach, Jeff Keeling made a powerful, emotional video to promote the Jacob’s Bike Ride & Awareness Walk and the development of the environmental education park. The pinnacle of their contribution was the interactive quiz that was created and the fabulous door prizes provided for Jacob’s Awareness Walk on Earth Day weekend. Numerous Rotarians were present to monitor a safe walk. They look forward to working with Jacob’s Project in 2014 and beyond for their community service for safe water. The Boone Watershed Partnership has submitted another grant application with plentiful community-match to the Tennessee Department of Agriculture for the construction of nearly 1,000′ of boardwalk with educational signs, two bridges, and a gazebo for an outdoor classroom. While we await the results of that application, the Johnson City Parks & Recreation is moving forward with planning and developing a hiking trail through the remaining acreage of hardwood forest and mossy rock outcroppings. Our Johnson City Parks Naturalist Program Coordinator, Connie Deegan, is anxious to begin with her ETSU interns next semester. Private fundraising for development of the Sinking Creek Wetlands Center in ongoing with mixed results. Certain businesses get excited to contribute, while others . . . of course, the year wasn’t perfect progress. The efforts of Jacob’s Project to garner any financial support from businesses within the Sinking Creek watershed resulted with either no response, “good luck,” and even, “the government should be doing something about it.” I guess that leads to the other unfortunate development of the year: the old warning signs about E. coli bacteria at accessible points downstream Sinking Creek were replaced with shiny new signs by the Tennessee Department of Environment and Conservation. Jacob’s Project is confident that this community will continue to physically and financially work together for restoration of Sinking Creek. As a result, Sinking Creek will be removed from the EPA list of impaired streams, the new signs will be removed before they get rusty, and families will feel safe exploring it. Jacob’s Project continues to get ready for Jacob’s Bike Ride & Awareness Walk in April, 2014. Newer event sponsors such as Carnegie Hotel, Earth Fare, The Bike Shop, ZZTopps, and Hampton Trails Bicycle Shop along with our additional host, Johnson City Morning Rotary Club have made it easier. The idea for this event originated with the Tri Cities Road Club within a few months of Jacob’s passing in 2004, and TCRC has been the gracious host since the first Jacob Francisco Memorial Century in 2005. Since 2005, the following businesses have been with TCRC as primary support for the event: Law Office of Slagle & Finney, Kroger, CopyNet, Knight’s Pizza, Piney Flats Bicycle & Fitness, Celebrate Rentals, Road ID, and ETSU. With the help of the health teacher at Indian Trail Intermediate School, David Nutter, and art teacher Beth Smith at Cherokee Elementary School, Jacob will reach another 1000+ students in 2014. They use the educational powerpoint that is found at this site to teach where harmful E. coli bacteria can be found and how to prevent contamination. The educational art that is seen along Jacob’s Awareness Walk on Earth Day weekend was created by students who have learned from this lesson. In 2014, we expect Jacob’s story will be shared exponentially and substantial progress will be made with the development of the Sinking Creek Wetlands Center. Please continue your support and share this webpage and Jacob’s fb community page to share your enthusiasm and interest. Please join us for a bike ride or a walk to celebrate Jacob and Sinking Creek Restoration during Earth Day weekend on 4/26/14. In the meantime, have a safe, peaceful, prosperous new year!